Editor’s note: This article was originally published in November 2016. It was edited and republished in October 2018. Every autumn, we’re bombarded by a big push from the media, hospitals, our kid’s schools… It seems like everyone around us is telling us that we need to get a flu shot. But are they effective? Are they safe? The annual flu vaccine is recommended for everyone 6 months and older. It claims to boost the immune system and help prevent coming down with the seasonal flu. Pregnant women, children, the elderly, and those with autoimmune complications are especially targeted as needing to receive a flu shot. Conventional medicine says that the human body is unable to naturally support immune defenses and prevent threatening environmental agents. But this is untrue. In fact, flu vaccines are increasingly shown to be ineffective and even hazardous to our health. The first vaccine was developed by Edward Jenner in 1796 to combat smallpox. Since then, pharmaceutical companies have developed a multitude of vaccines combating a number of illnesses. Vaccines involve injecting a person with a partial material of an infectious agent. Substances called adjuvants are added to stimulate the body’s immune response to the infection so that antibodies can be created to defend against future attacks. Before modern science, there was very little knowledge regarding the spread of infection or other serious health threats. Today we understand that the human body must be equipped with the lifestyle tools to build its immune system, which can protect us from life-threatening pathogens. Nevertheless, informational pamphlets, free vaccine programs, and the threats of medical providers have convinced us that vaccination is the answer to preventing illness. If the government and your trusted family doctor encourage the flu vaccine, why would you question them? In the 1980s, the U.S. Department of Health and Human Services established the National Vaccine Injury Compensation Program (VICP) to provide financial compensation to individuals who have been injured by a VICP-covered vaccine. The VICP received over 3,000 claims related to the influenza vaccine over a 28-year span. Of these claims 2,928 were associated with serious injuries and 114 included fatalities linked to the influenza vaccine. The U.S. Centers for Disease Control (CDC) releases new vaccination recommendations annually dependent on the type of viruses they are predicting will be most common that year. A variety of flu shots are available based on a person’s age and the location of injection. For the 2016-2017 flu season the CDC recommended either the inactivated influenza vaccine (IIV) or the recombinant influenza vaccine (RIV). Formaldehyde: The intended purpose of formaldehyde is to inhibit bacterial contamination during vaccine manufacturing process. This preservative is listed as a human carcinogen by the International Agency for Research on Carcinogens (IARC). It’s known to devastate the immune system and cause cancer. Thimerosal/Mercury: Thimerosal is a mercury-containing compound used as a preservative. Its intended purpose is to inhibit bacterial contamination. Exposure to mercury causes damage to the kidneys and brain and is associated with inflammatory diseases like autoimmune disorders. Egg Protein: Residual materials from the cell cultures used to produce the virus in egg is left behind. Foreign proteins such as egg protein are metabolized into amino acids and may cause severe allergic reactions. Sucrose and Gelatin: Sugars and gelatin are used as stabilizers to protect the vaccine throughout transport and storage. Like egg protein, gelatin is a protein that can cause allergic reactions, including anaphylaxis. Aluminum salts: Salts like aluminum hydroxide, aluminum phosphate, and other mixed salts are added to the flu vaccine to stimulate the body’s immune response produce antigens against the virus. Aluminum has been clinically shown to cause autoimmunity, neurological diseases including multiple sclerosis, and local adverse effects to the site of injection including fatigue and muscle pain. Neomycin: Another residual agent, neomycin is an antibiotic that is added during the manufacturing of the vaccine to inhibit bacterial contamination. Like any other antibiotic, neomycin reduces bacteria in the gut and is associated with weakened immunity. Neomycin is also associated with causing allergic reaction, impairing hearing and nerve function, and is kidney damage. Monosodium Glutamate (MSG): A common substance found in all vaccines, MSG acts as a stabilizer to prevent degradation against light, heat, humidity, and acidity. MSG may trigger an allergic response in some individuals and is associated with cell damage and cognitive decline. Polysorbate 80: This ingredient has often been added to flu shots to help ingredients dissolve together. Polysorbate 80 is known to cause irritation to the skin, eyes, and the respiratory and digestive tracts. It has also been associated with metabolic dysfunction and a weakened immune response. Its toxic effects on humans when chronically exposed have not been established. What are the Potential Dangers of Getting a Flu Shot? Is There an Increased Risk for Neurological Dysfunction After Getting a Flu Shot? One of the greatest biologists and immunologists to date, Dr. Hugh Fudenberg was ridiculed for his speech given at the International Public Conference on Vaccination in 1997. In his comments, he stated that receiving the flu vaccine five years in a row had a tenfold increase on the risk of developing Alzheimer’s Disease. He had found in his research that mercury and aluminum accumulates in the brain leading to cognitive impairment. Many researchers today believe that our exposure to environmental toxins, including the heavy metal exposure we receive from vaccines, is causing the increasing rise in neurological degenerative diseases. These diseases include Parkinson’s, Alzheimer’s, and ALS (commonly known as Lou Gehrig’s disease). There is no single virus that causes the flu and there is no single flu vaccine that protects against all strains. Scientists have to make their best assumption as to which they think will be the most common threat each flu season. More than 3,000 various strains of the virus are narrowed down to 3 viruses to create vaccines. In other words, the flu vaccine does not protect you against all influenza viruses which you may fall ill from. Each flu vaccine contains components from the 3 predicted viruses so that the human body can increase its production of antibodies. Not a reliable science − this assumption also does not take into account the fact that viruses are constantly adapting to the environment. This decreases the likelihood that your flu vaccine guarantees you protection. Even if you are fortunate enough to receive a vaccine for the proper strain, it will be useless if your body hasn’t produced a full response (which takes 2 weeks) or if there is too much time (over 3 months) between the vaccine and viral exposure. The virus may have adapted over time to create a structure the body fails to recognize. This means that your body may fail to equip itself in the initial 2 week vaccination period and the antibodies your immune system has produced may no longer recognize the changed virus or viruses 3 months following vaccination. Relying on an annual flu vaccine to protect you and those around you from the flu does not benefit your health or offer your best chance of protection. The immune system can become damaged from a vaccine, especially if it is weakened from low vitamin D3 levels, gut dysbiosis, subluxation, and an inflammatory diet. Stay hydrated: Dehydration can make symptoms like congestion worse. Drink plenty of purified water throughout the day so that your detoxification pathways are able to function properly. Give your water an antiviral and antibacterial boost by adding natural disinfectant liquids like apple cider vinegar or lemon juice. Add variety by sipping herbal teas and nutrient-rich bone broth to feed your cells supportive antioxidants. Get adequate sun exposure: Without the sun, your body cannot synthesize the immune boosting component vitamin D3. This biologically active component is converted in a reaction beneath the skin during exposure to UVB rays. If you are unable to get the proper amount of sun exposure recommended for your skin color daily, supplement with 1,000 IU vitamin D3 for every 25 pounds of body weight. Supplement with vitamin C: Without healthy levels of vitamin C, your body is forced to use up its stores of glutathione to recycle old vitamin C. Vitamin C is critical for preventing oxidative stress and repairing tissue. Add foods that are rich in vitamin C to your bone broths and soups by including kale, chives, and other green vegetables. 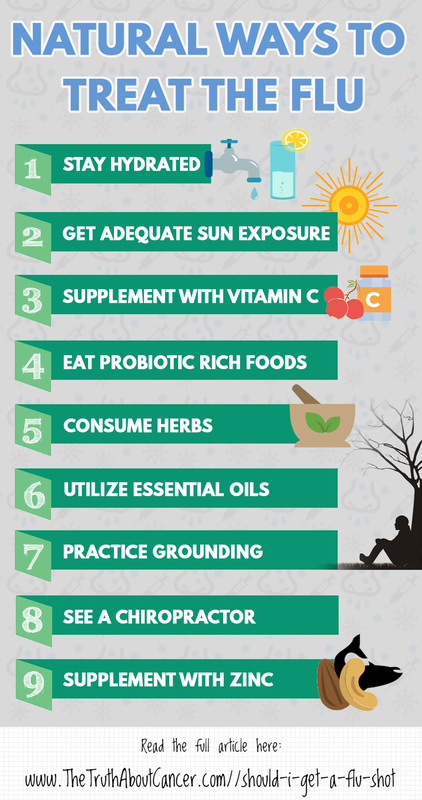 Consider supplementing with 2 grams of vitamin C every hour until your symptoms subside. The next day, restore your levels with 1 gram of vitamin C every hour that you are awake. Supplement with zinc: Zinc stimulates the activity of superoxide dismutase (SOD) to defend the body against pathogenic activity, including viral infections like influenza. Zinc also works to reduce inflammation and support antioxidants. Consider adding the following zinc-rich foods to your diet throughout flu season to give your immune system a boost. 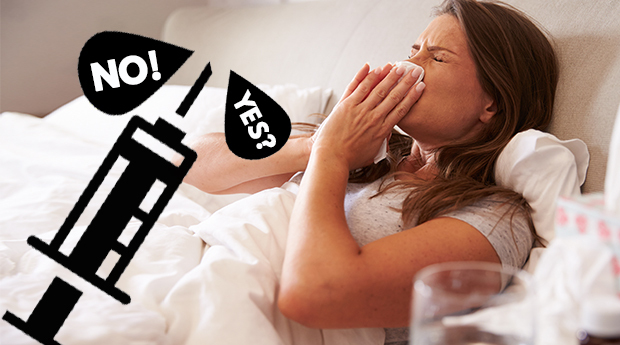 If you are already overcome with flu symptoms, supplement with a 20mg zinc supplement every 3 hours while you are awake until symptoms are gone. Eat probiotic foods: Your body is working overtime to fight off infection and repair inflammatory damage. If you find yourself hungry while dealing with the flu, avoid the temptation to eat processed crackers and other foods high in sugar and carbs. The majority of the immune system is in the gut, which means that your gut health is partly responsible for your total health. Eat probiotic and prebiotic foods to improve your gut flora and nourish those communication pathways for an optimal immune system. Squeeze citrus fruits into your water throughout the day and add leeks and Jerusalem artichokes to your soups. Utilize essential oils: Essential oils have been used for centuries and have been supported in research to reduce inflammation, calm anxiety, increase immune response, and lower circulating stress hormones. Try diffusing citrus oil to improve your mood and reduce symptoms of fatigue. Inhale eucalyptus oil in a bath to clear up stuffy noses and find relief from chest congestion, or rub peppermint oil on to sore muscles. Consume herbs: Herbs have been a powerful healing tool recorded in Egyptian scripture writing and remain the primary tool to combat flu symptoms in Europe. Ginger, oregano, Echinacea, and thyme have powerful anti-inflammatory responses in the body and as well as antibacterial and antiviral properties. Crush a clove of garlic between your teeth before swallowing to help reduce respiratory symptoms associated with the flu. Garlic and onion contain a sulfur-containing compound that boost your body’s natural antioxidant defenses and should be added to your diet daily. Practice grounding: The world around us contains electromagnetic frequencies (EMFs). One way to counter the harmful effects of EMFs is walking barefoot on the ground. Grounding allows the body’s electrical energy to balance with the Earth’s rhythms. This exercise has been shown to help build a strong immune response to improve healing and recovery time by decreasing cortisol levels and reducing fatigue. Take a book outside and sit on the grass to catch those necessary rays from the sun while helping to boost your mood through grounding. See a chiropractor: Removing subluxation or interference from the nervous system through chiropractic care has been shown to increase quality of life. Chiropractors seek to remove any abnormal pressures on the spine that may be causing an abnormal immune response. Seeing a chiropractor while battling the flu can stimulate your immune defenses by increasing leukocytes, or circulating blood cells called polymorphonuclear neutrophils. These biological agents help fight against viruses that cause influenza. Vaccinating your child is one of the most important decisions a parent can make. That’s why we created The Truth About Vaccines – giving you all the data and scientific facts about vaccines today from the world’s leading experts. Flu vaccines are increasingly shown to be ineffective and even hazardous to our health. A variety of flu shots are available depending on a person’s age and location of injection. This 2016-2017 flu season the CDC recommends either the inactivated influenza vaccine (IIV) or the recombinant influenza vaccine (RIV). There is no single virus that causes the flu and there is no single flu vaccine that protects against all strains. More than 3,000 various strains of the virus are narrowed down (based on a best guess by scientists) to 3 viruses to create protection against. You people are worried about getting a flu vaccine or childhood vaccines to help prevent serious problems or death because you say it’s cancer causing??? Let’s be enlightened a bit. Be more worried about what humans are doing to the environment that cause cancer or what are in food as preservatives such as BHT. What about the effects from human trash and what is happening to humans from those effects? I’d rather the flu vac than have my kids die from the flu as the flu symptoms aren’t as severe with the vaccine. I know of two people who were injured from the flu vaccine. One was a high school student who is now paralyzed and in a wheelchair and the doctor confirmed it was from the flu shot. The other is a friends little boy who now has brain inflammation because of it. Different parts of the country. Most people don’t have reactions from it but if it is your child who does, you think a little differently on the subject. Lol you say “you people” as if “we” are a race on our own who don’t care for our children due to being open to new ideas “that is” the rest of the information that “Should of been provided”. At the least you should not just believe a manufacturer, what do you think manufacturers do? Push to make their own pockets full. If your open to “just believing” in the glue shot alone for example, tell me why it’s not classified as a pharmaceutical drug? Tell me why the other ” compulsory” immunizations are not pharam drugs when it’s forced upon us to get into schools i.e.? To make it pharmaceutical you get the pro and con research of the effects shown to us up front? Why hide part of the research? Hmmmm brain washing my friend is what happens in the marketing pushed upon Dr s who have been told half the story, however we think Dr s are smarter than us, don’t we? We listen to them because they said something better than we can think! We do not question. Well I do question and I’m wondering why a lot of these immunisation shots are researched by the manufacturing business and not independently? Why did our government member have shares in Merc with his wife, and make it compulsory at the time to be shot with particular immunisation programs or not get the dole, lolz? Hmmmmm? Why have some other countries taken the program off the table due to side effects, and got insurance programs to pay out the customers of the immunisation program, when we still give triple antigen? There are lots of cover ups and lies, it’s just another dirty business, and tell me why autism is getting wider, yes environmental factors both within and without the body in our environments. I rest my case. What makes you think that the flu shot — which assaults the immune system by bypassing the critical mucosal membranes with hazardous neurotoxins, and inflames the brain AND makes children SIGNIFICANTLY MORE vulnerable to upper respiratory infections will prevent your child from “death? !” Honestly, you’ve fallen hook, ; line and sinker for unsubstantiated phony disease mongering “flu” death stats… Stats that fall to pieces when lab tested! Even if the vaccine works as claimed, it only covers several strains of influenza while the VAST majoirity of flu-like symptoms come from over 200 viruses that mimic cause flu-like illnesses. Furthermore, those who get the flu vaccine can SHED for weeks after causing illness in others. Sorry, but you seem dismally unaware of the evidence showing vaccines are heavily implicated in cancer, not to mention a host of auto-immune and neurological disorders. REAL immunity is one’s best defense against serious illness… And why should criticism re. vaccines — which are INJECTED, not INGESTED! — and cancer be interpreted as indifference to cancer causing substances in the environment?! That’s an illogical assertion. TTAC, takes on carcinogens of all kinds and sources! SMH!!!!! Take care of your children by making them eat right, dress appropriately to the weather, and they won’t need the flu shot. Injecting your child with poison is as wrong as neglecting them as far as I’m concerned. But truly I’m no more right then you are wrong. Perhaps this email and group is not for you- we all have different beliefs. You may wish to go to a group that supports the CDC, flu shots etc. As a teacher, I was never sicker than when I got a flu shot! Nope, not clinical research with double-blind studies, but a woman with a few autoimmune diseases who takes supplements, eat as clean as my daily life permits (some days better than others), take bone broth etc. Not perfect at all, but certainly see the injury vaccines do! My dear friend’s father got the shot 2 years ago as work offered it free, he walked to the parking lot to his car, collapsed and became immobile. Just starting to walk again! Shortened version of all of the other things that happened as a direct result of the flu shot. He is not able to work again as a result! Get your shot as see fit, and move on! I am glad that the vaccine is good fit for you and your family! Be blessed and do what you need to do to be healthy! You do not die from the flu.. That is a misconception, and strategy the govt used to scare people in order to control them by getting them to take the flu shot, among other things. Slave mentality. What are your thoughts on elderberry supplements? I make my own syrups and tinctures and have only ever received one flu shot. My 94 year old Mother doesn’t get the shots either. She got one only one time and got pretty sick after it. We are both using elderberry. using elderberry works well for us a long with echinacea .the last time I got a flu shot I got very sick ,,I spent 3 days in bed .could not eat or drink anything . There’s so much I could touch on, but I’m only going to focus on a few points. You’re worried about the MSG in vaccines, yet also recommend that people eat meat and bone broths? 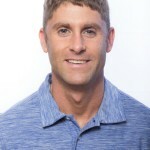 Bone broth and slow-cooked meats are high in glutamate, which gives them that delicious umami flavor; this glutamate bonds with sodium in the body to create…..monosodium glutamate. If you are so afraid of MSG, then I suggest you cut out tomatoes, olives, anchovies, mushrooms, broccoli, aged cheeses, and wheat. But you shouldn’t, because the nutritional benefits of these foods far outweigh the supposed fear of MSG! In addition, 2 g of vitamin C per hour is FAR over the recommended daily allowance, or even the upper limit as recommended by the Mayo Clinic. While vitamins are undeniably good for you, an overload of vitamin C can cause some nasty symptoms like diarrhea, vomiting, or stomach cramps. The whole point of nutrition is to balance out your micro- and macro-nutrients, not overload on a single one that cannot work in isolation! I’m not going to pretend that this entire website doesn’t infuriate me, because it does. My mother died of brain cancer when I was a kid, after living a healthy life with a balanced, organic diet. Cut the crap and stop the fear-mongering quackery, it’s doing more harm than good. PS, since we’re such fans of anecdotes on this site: I’m fully vaccinated (including the annual flu shot! ), with no ill effects other than a bit of soreness in my arm for a day after the injection. To this day, the worst illness I’ve ever gotten was a mild lung infection that was quickly resolved after a quick course of antibiotics. Never gotten the flu, never gotten a severe reaction, never been hospitalized, never got cancer. Remember, your experiences are not universal without data backing it up. No One truly have all the facts amount cancer one thing for sure is we all have the cells so my question is why is it only some develop it, I see all sites like this as a way to help empower and it is up to me to use discerment it is okay to be critical but we waste so much time being angry which is an underlying cause of cancer ,We are all unique so our experiences are different ,NO I have never taken the flu Vaccine I never contracted the flu and I was in the health profession as soon as the issue of vaccine being compulsory I left, While working the only staff who became ill interestingly was those who were vaccinated, Maybe there were other reasons why they had the flu, we are all different so a guideline is just that, a person may need less or more or a recommended dose,When articles trigger emotions in me I ask what is the reason for such strong feelings where is it coming from and I deal with them,being healthy is a lifestyke choice read articles with discernment if a person feels fear after readng an article maybe they need to ask why am I feeling this. MSG that your body produces is most likely not the same as the artificial MSG manufactured for food products and vaccines. I saw a documentary on MSG that was originally created by a Japanese scientist and is still a closely guarded secret. Being Asian myself you would think that I should be immune to MSG because it’s used in so many Asian restaurants and processed snacks to enhance the flavor but actually I have found that I am allergic to it. It makes me dehydrated and my face gets tingly and numb, which is when I can tell that they used lots of it in their food (especially with soups). So I actually try to avoid it and specifically seek out foods that do NOT have MSG (at restaurants and when I go to the grocery store). Just because your body produces a substance with the same name as something manufactured does not make them equivalent or harmless. You are studying culinary arts not bio-chemistry/chemistry/pharmaceuticals which are dealing with synthetic manufactured substances, a totally different arena. Believe me I love culinary arts and I’m not trying to disparage you, but before you spew hate or knowledge in an area that you are not knowledgeable, know that there are always two sides to every argument. This website is trying to keep the average non-scientist citizen informed because there are a lot of fishy things going on (no pun intended). I can appreciate what they are trying to do because I have also witnessed many people die after getting treatment for cancer, after they seemingly improve (based on how they calculate their statistics), they go in for a follow-up treatment and I suddenly am going to their funeral. I’m not trying to exaggerate but have been more in shock with what’s happening to people around me. My dad had also witnessed it in the 80’s when chemotherapy was in its infancy and immediately killed his good friend who had been diagnosed with leukemia. I’ve also known someone else who had a rare form of leukemia and she chose not to get treatment and is still alive and is a grandmother today. It’s because of our economic system that the standard protocol of chemo/radiation is still being automatically used today even though it may be more harmful and deadly. Those drugs were developed in the 1950’s and some of those chemicals were taken from pesticides including rat poison. Would you feel comfortable with getting injected with rat poison? Knowledge is power. Also with the vaccine debate, I think today it’s more about the quantity of vaccines that are being administered to newborns that is harmful/deadly (80 shots required by CDC now compared to 5-6 that were required when I was born in the 70’s). So we are not just talking about one seemingly harmless flu shot, but add that to the others required now for kids and how much they are pushing vaccines on the rest of us. I don’t completely buy it and they are not 100% fool-proof!! Also the job of scientists is to look for answers to these problems based on empirical evidence but there’s corruption in there too bc they doctor their data, especially if it’s being backed by some special interest. I feel sad for the state of the world since it seems that we are not being allowed to just live/eat naturally but now have to eat GM crops that can withstand pesticides. Even your breakfast cereal has pesticides in it now (just revealed in the news). How can we fight this behemoth? I’m at a loss for answers. I got an email saying Cheerios has glyphosate (Roundup) in them. Oats in general as well and possibly other grains, depending on what is sprayed on the field before or after planting. I have seen posts saying glyphosate is found in most if not all vaccines. Kudos! Great Reply … Thank You. Good response. No anger, you just voiced your opinion, with which I agree. It always makes me wonder why some people get so angry about topics like these. It’s almost as if they feel guilty about it or something. Everyone has an opinion, so study and research to find the best answers for yourself and your family. That’s why I subscribe to this great TTAC website! I will do what is best for ME, no one else. I quit getting flu shots because I found out MSG was giving me migraines and I was allergic to eggs. I have several autoimmune disorders so don’t want the mercury. I take precautions during cold and flu season. I’m on a very limited budget, but I buy the best quality of food and supplements I can afford. I am 68 and am blessed every day! Thank you for this JP!! Well, good luck because the vast majority of vaccine reactions are long-term related to auto-immune and neurological disorders which can take years to develop.. I have a slew of studies on the Hep B vaccine alone and its link to serious conditions like MS, Lupus etc. If you think that a chronically inflmammed brain from repeated vaccinations (like the annual tobacco science flu shot), cancer causing retro-viruses etc. in vaccines, and A.S.I.A are no worry, then go ahead, be my guest and keep rolling up your sleeve for the quackery of the vaccine ritual. The body also makes ethyl alcohol, acetyladehyde and hydrogen peroxide, to name a few….but ingesting any of these can cause great damage to organs and cells. I have had flu shots for years , and three times became ill within days. The doctor said it can’t be the vaccine, since its dead…but the timing is more than coincidence IMO. What it CAN be is my body reaction to invasion, dead or alive…..but I will also say that the other twenty some times I got vaccinated, I had zero ill effects. SO, this year Im going to skip the vaccine and see what happens. I had a horrendous flu two years ago just after the vaccine….doctor said I was already infected before the shot…I did feel a little low that day. All in all, I see that vaccines have benefitted us greatly…polio, smallpox, tetanus, etc. I think the numbers show some people have reactions to them. but the numbers are quite small really. My mother developed a shellfish allergy after decades of enjoying her favorite seafoods. Life is full of strange twists and turns. If I had a child, i would not want to risk polio or smallpox, whooping cough or dithers…all diseases that killed children regularly in the past, virtually unheard of today. Life always includes risk. To me, the risk of vaccines is very low compared to the benefits. I am glad that you are speaking out about vaccines.Thankyou. Thank you so much for sharing this important information. My employer coerces us to get yearly flu shots by saying if we do not get one we have to wear a mask for 3 months in the office. I have long wondered about the ingredients, because no information is shared at all with us, as we line up for our shots year in and year out. Now I know, and can make an informed decision. Thank you! I also want to thank you for the education you provide about cancer and health. I have watched all 9 episodes of the Truth About Cancer series, and I have just shared it with my sister. We no longer have to live in fear and dread of this disease. You are doing a wonderful work. We are glad you found us! We hope you are learning lots of information. From what I have heard, some one who has been vaccinated can actually give the flu to others so wearing a mask around all the vaccinated employees is likely a good idea. Tell me please. What are still life-threatening diseases from which you still need to be vaccinated. I just stick to Beta Glucan during Flu season. Maybe try getting a few infusions of the Myers Cocktail or a LARGE vit c infusion flush (might cost 100$ depending on where you live and take 2 hours burns going through the veins, FY)I, but worth it! My grandmother received the flu shot for many years with no issues until she finally did have an issue. She got Guillain-Barre as result of the Flu shot. She was paralyzed from the neck down and spent weeks in the hospital. She eventually recovered for the most part. No one in my family has taken the flu vaccine since that time over 30 years ago. My 10 year old is rarely sick and if she gets sick it’s generally mild and lasts no more then a day. I was given a ” bundle” of shots at 18 months old in 1952 and from that day one have had to suffer chronic asthma fact is we are not all the same ,i heatd the acceptable failure rate is 2% well that certainly is a fail..
Doctors and medical people take an oath ..first do no harm ! We are so sorry to hear this Gerry! 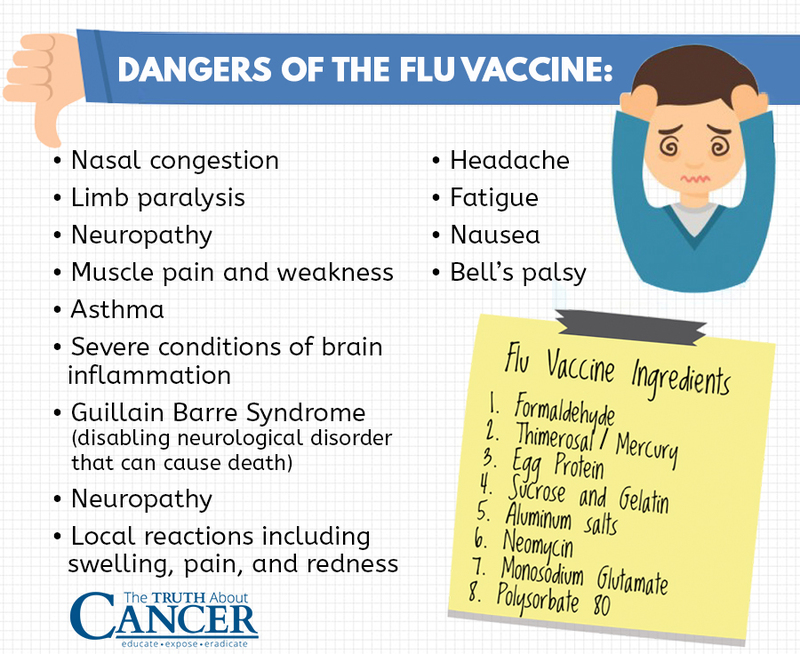 My grandma got the flu and Guillan Barre syndrome after a flu shot several years ago. She almost died, but thankfully after months in the hospital and rehab she recovered. It was years until she regained her strength enough to walk without an assistive device. She still has some neuropathy in her feet and legs. She won’t get flu shots anymore and in the years since she’s never gotten the flu. Her neurologist confirmed it was from the flu shot. It is a known side-effect. I’m a nurse and I don’t think I’ll be able to work in a hospital again because every one I’ve worked in before requires the vaccine. I’m not willing to risk it. My health was already compromised from vaccines. If I get sick I stay home til I’m better. I practice proper hand washing, take all the vitamins you listed and more, take elderberry syrup and use essential oils. I’m thankful for better options! I took a flu shot many years ago and became very sick and almost went blind. It took 27 years to recover my eyesight from the flue shot. The United States medical arena is a monopoly and it is difficult to go against it, but we have to. US citizens are lied to constantly about all types of medical information. We spend the most money for health and yet keep getting lower health than many other nations. The FDA is a farce, the politicians don’t care, the food industry constantly lies. Sorry but we a citizens have to learn to get the true facts about keeping our good health and not depend upon the doctors or hospitals where 1000 people a day are killed by doctors in the US. From the government that brouht Vioxx and fen fen to us. A friend lost his 23 yoa m new wife to these people. Medical tyranny. The new flu shots will be made from dog kidney cells and fall army worms. What do you think happens when you inject fragments of this DNA into the body? And then we have thimerosal and formaldehyde which are neurotoxic. Where are the studies looking at the long-term effects of vaccine administration? We can not sue the vaccine makers because they are immune to prosecution. If they are not being held accountable for their product, can we really rely on them to create a product that is safe? Remember Phenphen and Vioxx etc.? And why are they immune to prosecution? Could it be that they are afraid of litigation and tremendous financial loss? In my opinion, common sense is seriously lacking with regard to vaccine administration. And it is even worse when you look at pediatric vaccines. Everyone should have a choice on this matter! My best friend got a flu shot every year. He got a neurogenetive progressive aphasia, and died of sepsis while in a “memory care” home. I’m wondering if the sepsis was caused by a final flu shot. You are not just at risk of Guillan Barre Syndrome but also Transverse Myelitis, a rare auto immune neurological disease, after a flu shot. Unlike GB (attacks peripheral nervous system) it attacks the spinal cord (central nervous system) causing paralysis and extensive nerve damage. The recovery prognosis statistically) is far worse than GB. An elderly lady I know had an onset of TM immediately after a flu shot. Several doctors told her this was the trigger – the flu shot. I have not had a flu shot in 35 years and despite the TM have not had flu in that time. Infact I am rarely sick except for a bout of shngles. Eating well is the first line of defence for everything. Thank you for being with us Rachel! Can you advise:- In the UK we are also bombarded with ”Get your Flu Vaccination” . I have never used this service because I do not trust the quality of the injected material. Is the version used in Britain the same as the subject of your article being offered inn the USA? One thing the doctor did not mention is the fact that it’s very possible to get too much zinc. 20 mg of zinc per hour may be OK for most, but be careful attempting to take much more than that; older patients, typically with weaker immune systems and metabolisms, can wind up getting zinc poisoning, which can make a person miserable indeed with symptoms far worse than the flu symptoms.